My husband told me this is the best cake I have made so far. I am a person who normally does not eat the icing on cake. 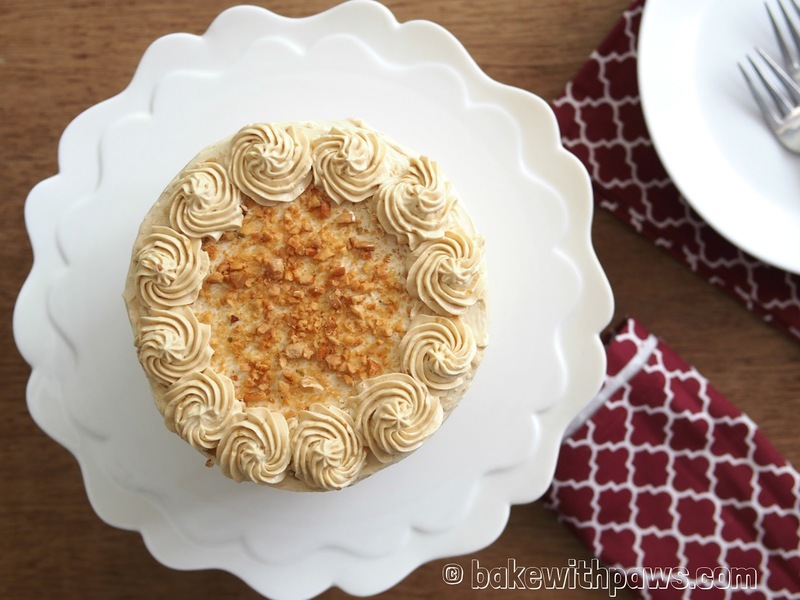 However, this buttercream is an exception - I would eat it because it is so delicious. 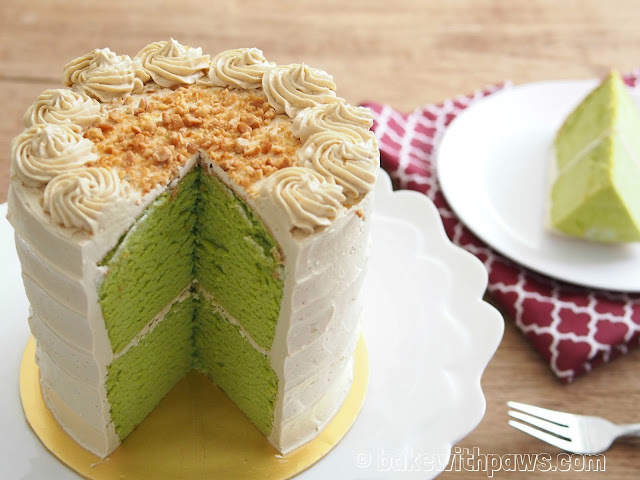 Adapted from Butter, Flour and Me with some modifications and followed the method of Jeannie Tay's Pandan Sponge Cake. 50g homemade pandan juice (screw-pine leaves juice), very thick and concentrated juice. Heat corn oil in sauce pan over low heat until it bubbles, swift off the heat then add in the shifted flour mixture and mix well. Remove from heat and transfer to a mixing bowl. Then add in milk and pandan mixture, mix with spatula until all incorporated. Gradually add in the egg yolk, stirring with a spatula or hand whisk until smooth. Set aside. Add flour in heated oil is called Cooked Dough or Tang Mian method. The cooked flour will make the cake more softer. However, it is fine if you want to omit this step. Cut the dome off from the cake and place on a cake board. 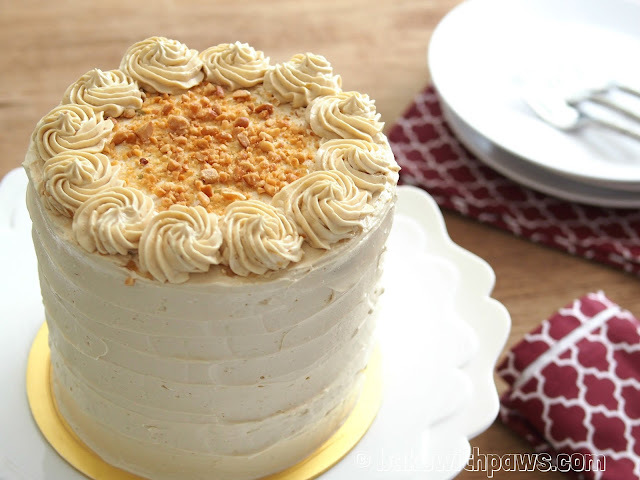 Spread a layer of Gula Melaka Swiss Meringue Buttercream (GMSMB) on top of the cake. Then stake the second cake on top. Coat the entire cake with GMSMB. Sprinkle some chopped roasted cashew nuts on top of the cake and pipe swirls. Great recipe! Can u share how did u make the concentrated pandan juice? Thanks! Thank you for dropping by. 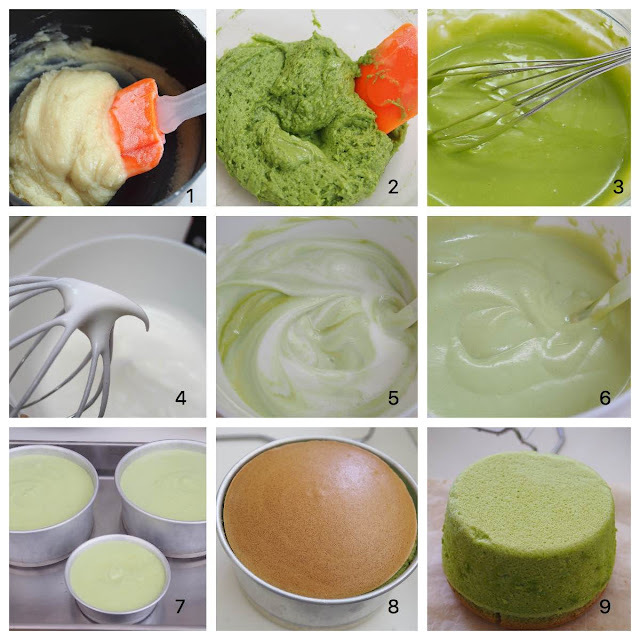 Please refer to my Onde Onde Cake recipe link below for how to make Pandan Juice method. Hi, can this be turned to a naked cake? So tempted to make your cake for mother's day! Hi, thanks for dropping by. I am really sorry for late response. Sure! Of course. You may decorate any style you prefer. Hi, thanks for sharing your recipes I cannot wait to try this!! Will this cake taste airy and light like chiffon cake or will it be more of dense but moist sponge/butter cake? Thank you for dropping by. It is a chiffon cake recipe. But, it is baked in normal tin. So the texture will be slightly dense if compare with chiffon cake baked in tube tin. Hi thank you so much for letting me know! I am still an amateur baker but love to learn more about cakes. I didn't know baking the similar recipe in different pans would result in different texture! but that's great to know!! Thank you! Would you also recommend using regular Buttercream for the frosting? instead of swiss meringue? You are most welcome :) The texture is only slightly different. I would highly recommend Swiss Meringue Buttercream because it is smoother and less sweeter. I made this cake today and everyone loved it. Cake was light and full of pandan flavour while the buttercream was light and buttery. However, I probably heated up the oil too much and ended up burning the flour. I tried again without heating the oil and it came out great :) thanks for the wonderful recipe. Hi there, You are most welcome... Great to hear that you like it and thank you for trying this recipe. Yes, you should omit the cooked flour method if you are not comfortable. May I know the reason why u heat the oil first before u mix into the flour? Does it result in a better cake texture? Thank you for asking. This is called Cooked Dough or Tang Mian method. The cooked flour will make the cake more softer. However, it is ok if you want to omit this step. Thank you for your reply. I will give it a try. I have just baked the cake .The texture is so fine n cottony. So good. Thank you for sharing this recipe with us. Hi! Looks amazing. How do you prepare the pan? Do you grease or use parchment paper? Thank you, Surya for dropping by. I lined the base of the pan with parchment paper and grease the side. Thank you for your question. It is normal it will look curdled at one stage, but you have to keep on beating until it combines into a smooth buttercream. It may take for a while. It could be also your meringue still warm. You need to wait until the meringue back to room temperature. You may leave the meringue in the fridge for 5 to 10 minutes to speed up the process. Hi, I your cake looks amazing. I would like to make it into cupcakes. Will it make any difference to the texture of the cake? And 1 more thing...if I omit the cream of tartar, will it be a problem? No worry! Thanks for your questions.. Yes, you can make into cupcakes. But, you need to cut down the baking time. Around 20 mins or until the skewer come out clean.. Cream of tartar is to make the Meringue stable. Your meringue will break apart. You can replace with 1/2 tsp of lemon juice or white vinegar if you don’t want to use cream of tartar..
You are most welcome, Najah! Thank you for the updates. I am happy to hear that your family and friends like it. You are good baker too..
Hi! My cakes always shrink when I reduce the temperature from 170 to 150. Do you what's the problem? Thank you for your question and trying this recipe. It could be your oven is not hot enough and the inside the cake still raw. All the ovens behave differently. In this case, please try not reduce the temperature and see what happen. Remember, please do not open the oven door too, the temperature may drop. Cheers and I hope this help. I noticed that you baked it in 2 6-inch round pan. May I know is it possible to bake it in one 8-inch or one 9-inch round pan? Please advise. Thanks. 42g homemade pandan juice (screw-pine leaves juice), very thick and concentrated juice. For the meringue buttercream, can i use margarine instead of butter? Thank you for asking. I guess you can. But, I never used margarine because I usually avoid process trans fat like margarine. I tried ur recipe but I failed at the step after adding in yolk to the flour batter. the batter still remain like paste texture after adding in yolk and when I add in meringue, I could not mix both together. end up the cake is very lumpy. I think the texture of the batter after adding in yolk should be watery? or did I missed any steps? My cake deflates. Could it be I line both bottom and the side with parchment paper? Please line the base of pan only and not the side. If your cake shrink a lot, please use another method. Immediately invert the cake after removing from oven. Unmould the cake after 15 to 20 minutes. Thank you for your advice. I will try again. Hi is there a substitute for double action baking powder? You may omit double action baking powder or baking powder if you don't have. Lately, I have been baking without adding it. The cakes rise nicely too. Hi is there a substitute for double action baking powder? Do you check the temperature of the egg whites for the SMBC? Hi, I didn't check the temperature. But, you need to use your fingers to check any unmelted sugar and it is warm and not hot. I tried this recipe. It doesnt match to my expectation. The method was so hard but the outcome is not what i expected. I think there are many other simple recipe for pandan gula melaka. Thank you for your comment. I hope you will find other recipes that suitable for you. and what cream of tar tar brand are you using? Thank you for interest. You can use any vegetable oil. I don't think there is any different in texture. I used coconut oil, olive oil or canola oil sometimes. For cream of tartar, there is no brand on the packing, I got it from House of Ingredients. Cheers and happy baking. Hope you will like it too. hi there, i looked at your receipes of both your chiffon cake and cotton cake. the ingredients and methods look similar. however why do you let the chiffon cake cool completely in the pan before removing while you suggest to remove the cake immediately from the pan with the cotton cake? Actually chiffon cake and sponge cake recipe are quite similar. 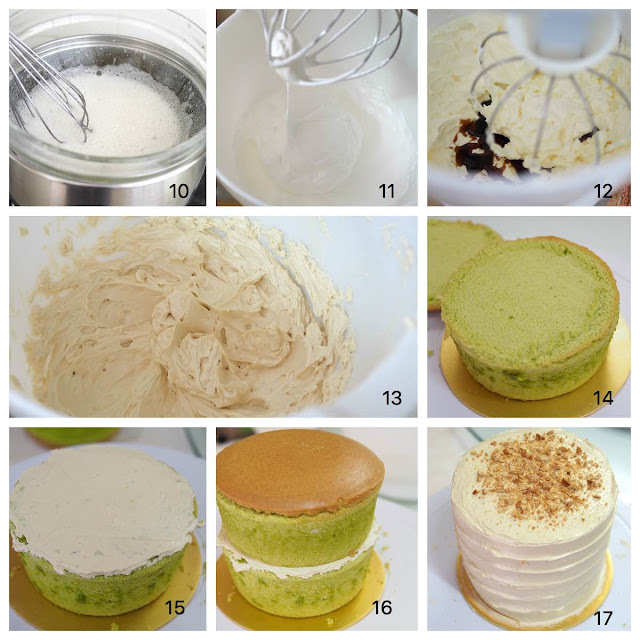 From what I know,, chiffon cake bake in tube tin and sponge cake bake in normal round tin. I called it cotton because it is cooked dough method and I found it very soft like cotton. Anyhow, just a name. There are few methods of cooling down. For this cotton cake (sponge cake), you can also invert the cake and let it cool completely before removing the cake tin. Please try few methods and stick to the method that it works for you. After so many bakings of sponge cake, I find the inverting method and let it cool completely before removing cake tin work better for me. I have one question though - is it possible to put the buttercream and everything on, and place it in the fridge the night before? I'm taking it with me on a 3 hour travel. Thank you for trying this recipe. I am happy to hear that you like it. Yes, you can. In fact, this cake with buttercream can stay in the fridge for a week. One of my friend kept in the fridge for almost 2 weeks as she forgotten and still taste ok. But, of don't purposely keep so long. If you can pack the cake in the cold box during your journey will be good.